Happy New Year and welcome back. In Year 2 we have lots of exciting lessons planned across the curriculum for the next six weeks. The children have settled back into school very well and are excited to start working hard again. This half term our core texts is ‘The Dark’ by Lemony Snicket. The children will be exploring letter writing and diary entries. So far the children have really enjoyed the text and loved exploring our classroom shed, which has been transformed allowing the children to experience what the dark is like. In maths we will be learning strategies to work out addition and subtraction of two digit numbers up to 100, addition and subtraction involving money and multiplication and division. The children will also be continuing to learn their 2, 5 and 10 times tables on a daily basis. In our Come and See books we will be learning about the different types of books used at home and in school and the importance of these in our lives and the books used in mass on a Sunday by the parish family. In science we are learning about Health and Growth. We will be learning about the importance of exercise, healthy eating and the different stages of growth. In history we are learning about Thomas Edison and the invention of the lightbulb linked to our core text ‘The Dark.’ We will be drawing and painting some pictures involving natural light. In computing we will be using a search engine to research Thomas Edison. The children will learn how to copy and paste and compile a fact sheet about the invention of the lightbulb. Reading books are changed on a daily basis. Please ensure you read with your child as often as possible. Year 2 is an important year and their ability to read and understand texts is crucial. Homework- handwriting, reading comprehension and times table homework will be given out every Friday to be returned for the following Friday. Please ensure green homework books are returned regularly so new homework can be put into their books ready to go home the following week. Every child has a mathletics password which can be accessed at home. User names and passwords have been given to each child in year 2. Please come and see me if you need this information resending. PE- PE days are Tuesdays and Fridays. Please ensure children have their PE kits in on these days. 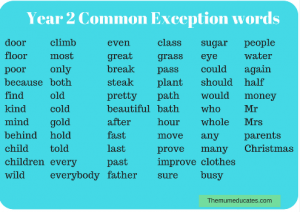 Please find below the year 2 spelling list which the children need to know how to read and spell.